File Name: Thomas R. Rossi III of Providence, Rhode Island. Notes: Providence, the state capital, is located at the mouth of the Providence River. Ace, Bullhorn, Dogfight, Ice Cream Soldier, Skystriker, and Major Storm also come from Providence. 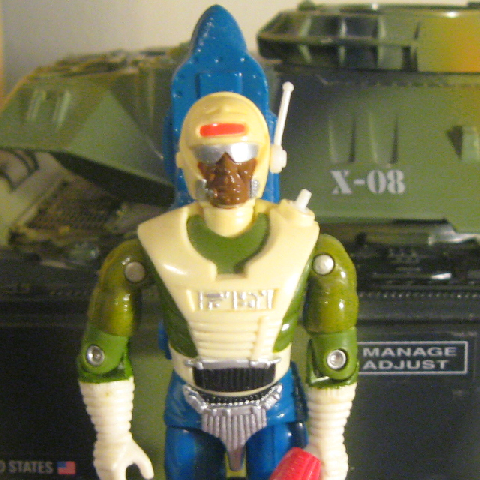 Hasbro's headquarters is in nearby Pawtucket, which is why so many Joes come from this state. Dee-Jay was animated only for commercials. Accessories: dark red futuristic laser rifle with severely angled trigger guard (new), small white antenna with round base (new), blue communications backpack with two engraved satellite dishes (new), two small white plugs with pegs for hose (new), short black hose (common). DEE-JAY was the baddest, hottest disc jockey in Boston before he signed up for the Battle Force 2000 team. Complicated sound equipment was no problem for him. If it is loaded with transistors, portable, and transmits or receives radio waves, Dee-Jay can make it work, fix it, and coax strange sounds out of it with an infectious beat. "Simulated ground-wave transmitters and ultra-fast burst encoders are complicated pieces of electronic hardware. If you're pinned down in the bush and need a medivac extraction or old-fashioned air support, you're just whistling in the wind if your radio is down for the count. His teammates can count on Dee-Jay to get the message out, even if he has to rebuild a transmitter from parts. Once he's on the air, it's his chatter that they can do without." Toy Notes: Item #6531. The prototype shown in the 1989 insert catalog has a segmented white hose instead of a smooth black one. Accessories: gold submachine gun (91 Tracker's), white antenna (89 Dee-Jay's), black figure stand (common). Cobra has recently developed a weapon so dangerous that it threatens the safety of our entire planet! Perched high upon Mt. Everest, what is believed to be a giant thermal conversion laser cannon stands ready to strike targets at strategic military base camps and heavily populated world cities. The laser cannon must be destroyed to prevent global devastation, a task perfectly suited for G.I. Joe's elite Arctic Attack Force. With SUB-ZERO—a winter operations specialist—leading the mission, he's assigned DEE-JAY to climb Everest and plant explosives at the base of the laser cannon. For them to succeed it will be up to STALKER and Sub-Zero to fight off platoons of SNOW SERPENTS, Cobra's polar assault troopers who specialize in Arctic warfare and have adapted to Mt. Everest's freezing winter temperatures. The mission is risky, but the job has to be done...FAST! Toy Notes: Exclusive to the mail offer Terrifying Lasers of Destruction, along with Sub-Zero, Stalker, and Snow Serpent.